What will Pieper do for you? The February Exam is Coming! The July Exam is Coming! The essential course for anyone needing to pass the bar exam. Pieper’s Full Bar Review Course delivers all of the substantive law that you’ll need to pass the UBE, along with the strategies for mastering multiple-choice questions and maximizing your scores on exam essays and the MPT. You’ll be guided step-by-step through what to do, what to read and what to write, from the first day of class to the bar exam. Trusted by lawyers in New York and around the country for the past 40 years, Pieper’s Full Bar Review Course will give you everything you need to pass the exam and start practicing as an attorney. Pieper offers a specially designed approach to foreign-trained lawyers taking the bar exam by allowing students to begin preparations earlier than programs designed for American law school graduates, giving them an added—and needed—advantage. Offered three times each year, the Pieper MPRE lecture prepares students for the ethics exam, required for admission to the bar in 48 states, including New York. Now available on-demand anywhere in the world with a high-speed Internet connection. Succeed with this carefully constructed program designed for the working person who received a UBE score of 250 or above. This course guides students through a re-review of the substantive law they learned in their prior bar review course experience, while sharpening their writing and multiple choice skills. Programs designed to fit your schedule, your needs, your life. With 150+ hours of lectures, Pieper Bar Review offers more time in class than any other program, and all live lectures are given at New York Law School. Can’t join us daily in NYC? You’ll have unlimited, on-demand access to each course lecture, and you can view the lectures in a classroom setting with other students at law schools from Washington, D.C. to Vermont. Pieper offers both multiple-choice and essay exam preparation corresponding with each lecture topic, reinforcing the material as well as students’ test-taking skills. Students are exposed to thousands of practice questions by the completion of the course. Pieper’s team of attorneys will be there to answer substantive legal questions and guide you toward success on your first try. Pieper Bar Review is proud to reward exceptional students. Participation in a Law Journal, Moot Court Board, or a Career in Public Interest or Public Service may qualify you for special discounts. Learn more about Pieper Bar Review discounts here. If you’re a working attorney from the United States or abroad and do not have the luxury of being able to study full-time for 12 weeks prior to the exam, or perhaps you are a law student looking to get ahead, Pieper’s Early Start Home Study Program enables you to begin studying immediately, without having to wait for the start of Pieper’s next Full Bar Course in May or December. Succeed with this carefully constructed program designed for the working person who received a UBE score of 250 or above. This course guides students through a re-review of the substantive law they learned in their prior bar review course experience, while sharpening their writing and multiple choice skills. It meets on seven Sundays to assist students who cannot attend full-time bar review program classes and is taught live by Professor Troy G. Pieper. Lectures will be recorded and made available to students who cannot make every session. Enrollment is strictly limited. The Concentrated Weekends classes serve as a streamlined, efficient review of the most critical points of substantive law in the context of bar exam MBE and essay questions. Pieper’s tutors can help you overcome the obstacles standing between you and a license to practice law. Whether you’re struggling with substantive legal concepts, the written components of the exam, or how to select the best answer on a multiple choice questions, your tutor will make sure that you’ve done all you can to prepare for exam day and have you in a position to pass. Pieper’s Advanced Tutoring Program: The finest professional guidance available. 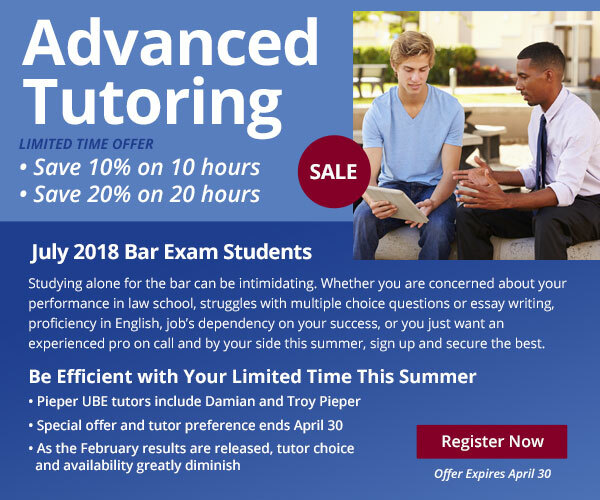 You’ll work with a highly skilled attorney one-on-one to ensure that your essay and MPT writing earns you top scores in any area of the exam, while tackling any areas in which you struggle on the MBE. Pieper’s Supplemental Essay Program: Sharpen your writing skills with an additional five essays and an MPT. Each assignment will be graded and commented on by one of our attorneys, before they walk you through it over the phone in a half-hour discussion of your writing and how you can improve it. Writing accounts for 50% of a student’s score on the UBE (30% essays and 20% MPTs) and is one of the most difficult and crucial practices to master. 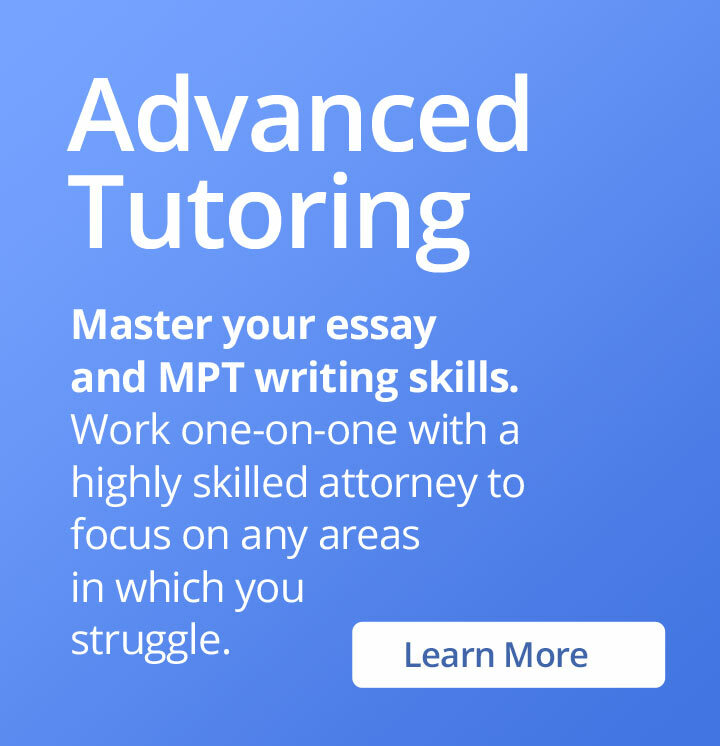 In addition to the essay and MPT writing workshops included in the Full Course, Pieper is now offering a specialized essay and MPT review that gives students the opportunity for personalized review and critique of four essay and two MPT questions with one of Pieper’s attorney graders in one-on-one phone conversations as well as detailed and in-depth assessment of each assignment. By working with the same attorney grader, he or she can identify students’ weaknesses and then track their progress as they continue to write. In addition to receiving a grade, students receive extensive feedback and a model answer for review, plus 30 minutes reviewing each submission on the phone (up to 3 total hours for the six submissions) with the attorney grader. This invaluable feedback will pinpoint and address weaknesses as well as foster an understanding of what bar exam essay graders look for. It is a comprehensive and effective way for students to learn and reinforce good habits in their bar exam writing. Pieper offers more in-class lecture hours than any other bar review course.